I am yet to recover (below left) from talking to Sanjeev Kapoor – the Chef extraordinaire, the Entrepreneur, the TV Host, the Author and an absolutely down to earth and one of the most humble celebrities that I have come across. My last post talks all about the candid, one-to-one interview that I had with him when the award-winning restaurant, OPTIONS By Sanjeev Kapoor, opened it’s second restaurant very recently in The Mövenpick Hotel Deira. I had also promised my readers that 2 couples will win Romantic Dinner Invites from this newly opened restaurant in this post. Two things that visibly excite me about this newly opened restaurant – a LIVE cooking kitchen in the middle of the restaurant and Akshada Parab, the Executive Chef (above right). Chef Akshada is one of the very few lady Executive Chefs managing the kitchens of Indian fine-dining restaurants in the world (and definitely Dubai’s first!). The feminine touch might bring back a whole lot of nostalgia related to Mummy’s cooking, as one waits in anticipation for the food, though I haven’t had the experience of having such a young Mummy! All this amidst a lot of aroma drifting out of the central cooking area accompanied by the background score of sizzling and tadka! I keep showing examples to the Z-Sisters all the time of girls achieving and succeeding in different professions – women astronauts, pilots, doctors etc. I’ve witnessed many Mummy-is-coughing-and-can’t-answer situations (for example, when the F1 Grand Prix was on in Abu Dhabi, they had asked me why there were no lady F1 drivers?). So, Chef Akshada… thank you for saving Mummy this time. As a woman you make me feel really proud! For a few days it had seemed like a preparation for a big fat Indian wedding – attending the soft launch of the restaurant a few days back; visiting it even the day before the opening and felt the nervous excitement of the staff as they were preparing themselves for the opening; and ultimately the final reception culminating in the grand opening itself! (More pictures of Soft Launch and Official Launch on my Facebook Page). The opening saw Chef Akshada as well as Chef Raturi (Executive Chef of OPTIONS in DWTC, 2nd pic from top in the above image) jointly cook up a storm, or should I say Kebabs, Mutton Rogan Josh and some brilliant Kulchas and Naans (that must have given you the trailer for the Lunch Menu). I didn’t have the luck to sit through the meal as I had better luck awaiting me in terms of being summoned to interview Sanjeev Kapoor. Each month a special food festival is celebrated at OPTIONS. I had previously visited the restaurant for RannaGhar, the Bengali Food Festival. Dubai doesn’t have many places where you can get to taste a Bengali meal. My experience was very good. Though there were a few hits and misses – the Kasha Mangsho/Bengali Mutton Curry wasn’t authentic, the fish was too fried in case of Shorshe Bata Maach/Mustard Fish but even for a traditionalista, the Deemer Chop/Egg Chops (Deemer Devil in Bengali), Shukto/Bitter Vegetable Preparation (the most difficult vegetable dish to imitate in my book! ), Daab Chingri/Coconut Prawn, Murgir Jhol/Chicken Curry scored high marks. And the Rasgullas were very good – really soft and not too sweet, presented in a very novel way! However, many of my friends who had gone towards the end of the festival didn’t have a good experience to recall. I had also mentioned how this restaurant in Kolkata should inspire the OPTIONS team to take Rannaghar to the next level! Each one of us who had attended the soft launch of the restaurant were given score sheets and were told that the restaurant was going to open up to the public only when each dish had got a score of 10 out of 10! We felt that the Starters had been extraordinarily good while the Main course still needed a bit of sprucing to match up to the Starters. In the Starters… The vegetarian Starters kick-started our food tasting. Spinach Dumpling – cooked with Garam Masala and served after unwrapping them from a foil covered pot, were the most delectable (Scored 10); Badam Bahar, another extraordinary rendition of crushed nuts cooked in spices and made into rolls (Scored 10); Vegetable Sheekh Kebabs were a bit disappointing though, falling flat on the taste (Scored 5); Both the Chicken and the Mutton Sheekh Kebabs were soft, juicy and succulent (was told that they had been marinated with special herbs, spices and yoghurt. Scored 10); Tandoori Prawns were mildly spicy, grilled to perfection (Scored 10); Tandoori Salmon was the winner all the way (Scored 10)! In the Main Course… The Daal Makhni was fabulous – creamy, buttery and rich in taste and aroma (Scored 10); Shaam Savera – this is one of Sanjeev Kapoor’s most popular signature dish consists of Palak Paneer/Spinach and Cottage cheese koftas (Cottage cheese balls embedded in spinach roundels) cooked in a rich creamy tomato gravy… absolutely delish (Scored 10); Butter Chicken failed to impress us. The gravy was too sweet and tasted almost similar to Shaam Savera (Scored 5). Butter Chicken is perhaps one of the most popular dishes in Indian cuisine and is most often requested, specially by non-Indian diners. So, this definitely needed some make-over. All the above was accompanied by the Bread Basket consisting of various kinds of Naans – stuffed and plain… I would have wanted them to be a bit more soft and fluffy (Scored 7). Worth admitting here, is that the Kulchas stuffed with Green Peas that were served on the day of the opening were out of the world. So I am assuming that the restaurant had worked on their score sheet. On the day of the official launch, we were served Mutton Rogan Josh which would have definitely scored another 10! How could I forget the sweet sign-off – the Desserts? Unfortunately, not much choice was left excepting Gulab Jamuns. Perfectly sweet for my Bengali sweet tooth, however too sweet for a few of my fellow diners – so we settled on an average score of 8! A LIVE cooking kitchen in an Indian restaurant is quite a challenge with a whole lot of smoke from the sizzling, specially the Tadka that is associated with the Indian cooking style. I had anticipated a lot of smoke and eye irritation. But this didn’t seem to pose any problem – there must be a strong exhaust system taking care of this. 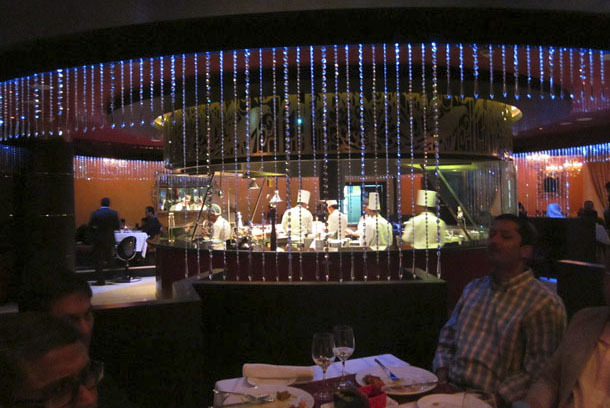 In fact, I felt that the entire experience was pretty much like a 4-D experience – we could see the food, smell the food, taste the food and hear the sizzle while it was being cooked! Adjacent to the Restaurant is The Fashion Lounge – equipped with a huge projection screen and fully stacked bar… a bit of lounging and chit-chat with your friends before you go inside the chandelier-lit restaurant for a formal dinner. I think the location of the new restaurant is going to be it’s USP – there are many diners in Deira but there are not too many fine-dining options. I am also wondering how does both the OPTIONS restaurants plan to re-invent themselves every now and then while maintaining their unique identity, specially in a city like Dubai where a new restaurant opens up every minute and the general trend is to visit a new restaurant every time? Different promotions and innovations are still probably the best bait while making sure that certain exclusivity is maintained in designing the menu, I was told. Is that sufficient to appease the seemingly fleeting loyalty of Dubai diners? Click here for the Blog Giveaway ! 2 couples can win invites to the newly opened restaurant. Friends on referral who join the contest must mention you (referrals could get you an extra point though!). The contest closes next Sunday, 20th January, 2103. Chandi Kaliya, Shaam Savera, Murgh Makhani/Butter Chicken, Methi Chaman, Kaache Gosht ki Biriyani… are just some of the signature dishes that you can taste in this newly opened restaurant, cooked in a LIVE cooking section in the middle of the restaurant. Specially crafted by the MasterChef, Sanjeev Kapoor himself! Disclaimer: The opinions stated here are my own and are independent of the dinner giveaway from the Restaurant. I hope you enjoy reading the posts with lot of visuals. Please do not use any material from this post. You can see more pictures of my travel and food journey here. Thanks Sandhya for entering the giveaway… we are big fans of him too. I was fortunate to interview him as well – did you read my last post? Good wishes to you! I know Namita. I personally know the names of each one of you who have been following my blog for long. Good Wises! All the best for your Blog!!! Awww – Mary! Good luck to you. When is your birthday? Movenpick Deira is very close to where I work so I can already imagine myself sitting in the restaurant one of these days! I love Indian cuisine and have been wanting to try out Options. Great to know they are here in Deira! BTW, did they replace the Wok In restaurant? You are so lucky to have met the man and interview him! I really love Sanjeev Kapoor’s recipe. They’re so easy to follow. Tumi interviewta porle Shubhomita? Very humbling experience. I can’t avoid my Bengali posts… and have been imposing a bit of Bong cuisine to all my non- Bong readers as well. Did you read the post on Bohemian? Good wishes Subhomita! Thank you Dina! Really if only I could make everyone win! Ahhha romantic dinners before having the kids? Good wishes for now – hope you can re-visit those days by winning the romantic dinner invite! You know me love Sanjeev Kapoor and Signature, so would love to try Options! Oh yes, I know FooDiva! Options is very traditional but definitely worth visiting. I love the LIKE cooking area in the new kitchen – gives you a complete 4-D experience! Hi Shy! Looooooooong time! A big welcome back:) Of-course you know him personally as well. Have your read the interview? What did you think of it? Would love to know your feedback. And Good wishes for the competition! I friend lent me one of Sanjeev Kapoor’s cookbooks once and I loved it! Can’t wait to dine at his new restaurant. He’s been a favourite in our ‘household’ – with Mum-in-law having a major crush on him:) Good wishes to you! i would love to win this lovely dinner.Already told a lot of my friends about this amazing giveaway! Thank you Martha… and thanks for sharing. I hope your friends mention your name when they leave comments on the blog post… Good wishes! i hope to win this amazing dinner.Referred by martha rodrigues! Wow! Really lovely to see how big a fan you are… We’ll have to leave it on the Randomiser. Good Wishes to you! Good Wishes to you… and your friend does get a bonus chance to be picked up by the Randomiser. Thanks very much! These pictures made me almost lick my screen. Too delicious ! Love this. Always wanted to go to OPTIONS. Hope to win this giveaway. Nice blog Lady ! Wishing your son a very Happy Birthday! Yes, the Randomiser has already picked out two names and it’s really breaking my heart to say that it’s not you this time. Good wishes for other upcoming competitions in the future! Oh 🙁 well thanks alot for wishing my son. Your message cheers me up. By the way he turns 2. Thanks alot. Thanks for the wishes. I will definately take part in other competitions. So lucky! I badly wanna go too! Your luck hasn’t worn out… the Randomiser may choose you too… Good luck! Good wishes to you Vinka… I’m gathering that you are the same Vinka who’s brought in a whole lot of friends to my FB page… thanks so much! Good wishes to you Sana… hope you are lucky with the Randomiser! Really an inspiring personality – OUR VERY OWN Sanjjev Kapoor. Its like he lives in all (us) Indian’s Kitchens. So proud of you for having met him personally Ishita!!! Hope you get many more opportunities to meet him, and hope I WIN THIS GIVEAWAY!!! Those kulchas look divine. I’ve never eaten one with peas in. Amazing Give away …Cant resist …hope to b the lucky one.. I hav being a big fan of Sanjeev Kapoor and hav n love watching his cookery show n especially his Khama khazana Chanel whichhas being a boon to us so that we getbtomtry so many new receipes ..Love the food at Options n as for Signature hav no words ..wana try this place too…n if i win dis romantic dinner wil be like n icing on cake ….new year mein meetha tho banta hai Boss…. 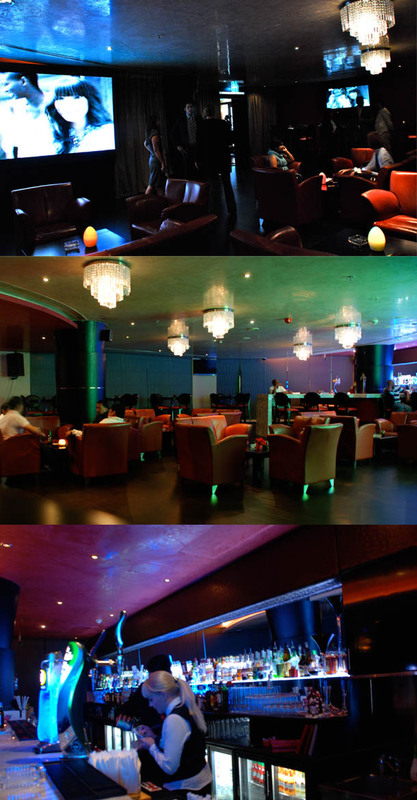 The Fashion Lounge is just a lounge bar adjacent to the dining area within the restaurant itself. The restaurant is non-smoking. But you can chill out in the Fashion Lounge and order for drinks and starters. Referred By Delaine Maria Dcosta. I am a huge fan of Sanjeev Kapoor. Our family never missed out on a single episode of Khana Khazana. We watched it religiously and we’d even tried out some of his recipes. I love his food and would love an opportunity to dine at his restaurant. As they say “The way to a man’s heart is through his stomach”. Yum Yum! Buttered Chicken was the first thing I requested my friend from Kerala cook for me but she’ veggie mama and prepared something else for me instead which was oh so yummy! It would be a dream to be able to dine at Options and first for us as well, hope to win! Hi Abigail – I thought I had replied to your comment from the email – but see… it hadn’t come in! Butter Chicken is also a speciality at Options… Good wishes then! Good wishes to you MunMun… and thanks a looooooooooooot for bringing a brigade of friends along with you… you’ve to be lucky with the Randomiser! Love the food mastero, I have a collection of all his books, and I love his cooking .. would really love to eat at his signature restra 🙂 good luck all.. btw Happy New Year!! Good Wishes Mary and a very Happy New Year to you too! Congratulations Mary Young! You have been selected by the Randomiser to be one of teh winners! Reffered by Mohammad Khurram. Whenever i am watching TV , I m always glued to Khaana Khazana because Sanjeev Kapoor makes very tasty dishes. And to eat in his hotel , simply great. Hope to win. Thank you and good wishes to you… his recipes are great, and OPTIONS does serve some of his signature dishes! Reffered By Mohammad Khurram. Being a great fan i just wish to win this Romantic dinner. He is such a great chef and he is so popular all over the world. Really feel proud for Sanjeev Kapoor. And also hope to win it. Reffered by Mohammad Khurram. WoW a lovely give away Ishita. His recepies are great and every women loves Khana Khazana Chanel of Sanjeev Kapoor. I think he is Star all over the world. Hoping my Friend or me won this dinner. Thank you for joining in… Good wishes to both you and your friend! I have been dying to dine at Options after seeing both your posts ( & even yummier pics) of the food been served. Every Indian at some point of his/her cooking period must have been inspired by Sanjeev Kapoor’s recipes. Would be a great experience to check out his legacy being carried on by the restaurant. Also, referred a friend Fatema Husain whose mentioned me in one of the comments. Reffered by Mohammad Khurram. I am one of the greatest fan of Sanjeev Kapoor. I got chance to see Sanjeev Kapoor in India but never tasted food from his restaurent. Hope to get chance this time. Good wishes to you Ehsan! Reffered By Mohammad Khurram. Great Fan of Sanjeev Kapoor , i think all r the fans of Sanjeev Kapoor’s because the way he represents himself is truly awesome and his recepies really awesome. Hope to win Ishita this Romantic Dinner. This one is definitely special. When I came to Germany some 12 yrs back with little real cooking experiences but very sensitive taste buds, I used to be a regular at sanjeev-kapoor.com (used to be free those days!). I remember flaunting the Shaam Savera to so many of my guests and I still use a lot of those recipes when I am having people over. So, being a huge fan, it’s a proud moment to see my friend with Mr. Sanjeev Kapoor and I’m so happy for you, Ishita. And BTW, the Z-sisters probably wouldn’t need to look too far to find a very successful woman entrepreneur! BTW, I have been thinking of giveaways for those who are not in UAE. The last giveaway I had promised (but then I think I’m pretty much human and have broken my promise!) Any ideas how I could do this? It’s my birthday next week so this would be a great place to celebrate! I loved your interview article, Ishita, and this one as well. That’s really wonderful. Good wishes to you and your friend! Reffered By my Friend Mohammad Khurram. Even if my friend will not refer i will post comment here because i m very big fan of Sanjeeb Kapoor’s recepies. All the best for my freind and me to win this Romantic Dinner. reffered By Mohammad Khurram. Thanks to my friend because i don’t know about this. I would also like to win this Dinner because i m also great fan of Sanjeev Kapoor. Hope for the best. reffered by Mohammad Khurram. I used to my food while watching the recipies of Sanjeev Kapoor. I just love that. To win Romantic dinner in Sanjeev Restaurent it would be awesome chance. Hope to win it . Good wishes to you and your friend! Reffered By Mohammad Khurram. I will always follow your blogs Ishita. And hats off to Sanjeev Kapoor for his achievements. Hope to win this dinner. Oh that’s amazing! Can’t wait to try Options! I AM A GREAT FAN OF SANJEEV KAPOOR HOPE TO GET LUCKY TO SEE HIM IN REAL AS WELL. I WILL SURE ASK HIM HOW HE MAINTAINED HIMSELF.I HAVE SEEN HIM ON KHANA KHAZANA SINCE I WAS A LITTLE GIRL. AND NOW I AM A MOTHER. What’s up mates, its great paragraph about educationand completely explained, keep it up all the time. Thanks! What education are you talking about?